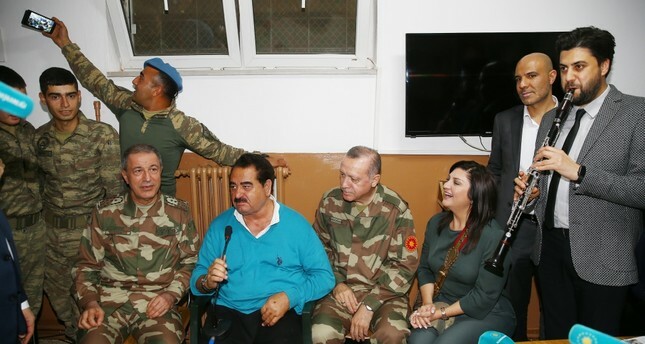 Chief of General Staff Gen. Akar (L), singer İbrahim Tatlıses (2-L), President Erdoğan (2-R) and clarinetist Serkan Çağrı (R), sing in a military barrack Hatay, April 1. A group of celebrities, artists, athletes and journalists paid a visit to Hatay province and the Oğulpınar border post on the Turkish-Syrian border late Sunday in support of Operation Olive Branch. Prominent artists and celebrities, including Ajda Pekkan, Yavuz Bingöl, Seda Sayan, Serkan Çağrı, İbrahim Tatlıses, Deniz Seki, Emel Müftüoğlu and Mustafa Sandal, were on the tour. Also, footballers from Galatasaray and Beşiktaş traveled with the group. The group was cheered and welcomed by a large crowd in Antakya, Hatay and then the group drove to the Oğulpınar border post in the Reyhanlı district on the Turkey-Syria border. "We cannot distinguish athletes and artists, therefore we have invited a group of prominent artist and athletes who will compete at the 2020 Olympics," Hamza Yerlikaya, a champion Olympic former wrestler and chief advisor to President Recep Tayyip Erdoğan, told Daily Sabah. "The main aim of this visit to boost of the morale of Turkish military that has been fighting against terrorist organizations heroically," he said. "We're here on Syrian border to boost morale of our soldiers," famous folk singer Bingöl said. "We not only aim to boost morale of our soldiers, we are also here to thank to them," Hülya Koçyiğit, a prominent actress said. "We are here to demonstrate our support for the soldiers who risk their lives for us," famous singer Mustafa Sandal said while in military uniform. President Erdoğan and Chief of General Staff Gen. Hulusi Akar joined the group at the border post. Erdoğan gave a speech at Oğulpınar dressed in military fatigues the commander-in- chief of the military. Expressing his happiness over the attendance of distinguished celebrities and athletes, President Erdoğan said that the Turkish Armed Forces (TSK) made history with Operation Olive Branch. The president asserted that the capture of the Afrin city center in an operation that did not even take two months indeed made history. He praised all the soldiers, gendarmes, police, guards, intelligence officers and Free Syrian Army (FSA) fighters who partook in the operation.He said that the attendance of a large group of artists and celebrities is a sign of solidarity and that the atmosphere there would spread across the country. "No group, party or faction can make moves by prioritizing their own interests. We find ourselves in a process where we must make moves by thinking outside our daily interests for the sake of our country and nation and contribute to the struggle by doing our jobs in the best way possible," the president said. Erdoğan said that all the artists, celebrities and athletes who went to the border over the weekend showed that they are aware of their responsibility. Later on, singer İbrahim Tatlıses, Erdoğan and the accompanying group sang the folk song "Yaylalar," which is associated with military service in Turkey.